DNMT3L antibody LS-C19023 is an unconjugated rabbit polyclonal antibody to human DNMT3L. Validated for ELISA and WB. 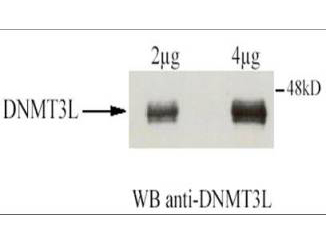 DNMT3L antibody was raised against synthetic peptide from human DNMT3L. aa 152-164 of Human DNMT3L (DNA (cytosine-5-)-methyltransferase 3-like). DNMT3L is a nuclear protein with similarity to DNA methyltransferases. Anti-DNMT3L Antibody - Western Blot. Affinity Purified Rabbit anti-DNMT3L was used at a 1:1500 dilution to detect human DNMT3L by western blot after immunoprecipitation using the same antibody. Transfection of U2OS cells (10cm dish) was accomplished using 3 ug of GAL4-DNMT3L. Protein extraction using IPH at 150mM. For IP and WB conditions see Fuks et al. (2000). For western blotting the antibody was used at 0.4 ug/ml in TBS milk 2%, BSA 0.5%. Detection occurred using ECL. Note: this antibody works for western blotting only following immunoprecipitation. We have not had good success using the antibody directly for western blotting. The expected molecular weight of human DNMT3L is 43.6 kD.